Dumpa waste is a fully licensed rubbish removal company that you can trust. We offer Cardiff and the vale an alternative to using a skip hire and the best part is we do all the work! That’s right we provide the labour and the vehicles to clear your rubbish so you don’t have to do a thing and all this at no extra cost to a Cardiff skip. Both commercial and domestic, house, garage, garden, shop, factory, office, loft, shed, whatever it is we can clear it all. There is no job to big or small for Dumpawaste. Dumpa waste is fully licensed by the environment agency of Wales so you can rest assured that all your waste is disposed of correctly. All waste is taken back to a fully licensed transfer station where 80% is recycled which keeps our tipping prices down which then enables us to be the cheapest around. You don’t want to pay those crazy skip prices, you can’t get a skip down your lane or outside your house, and you don’t want to pay for a permit? 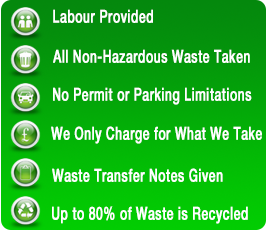 Then ring Dumpawaste for your FREE QUOTE on Cardiff skip's because we are hassle-free. We have a huge clientele ranging from landlords, builders, schools, kitchen fitters, plumbers all the way up to the person living next door. So why not use us? Everyone else does. 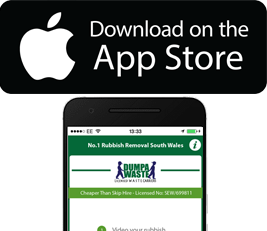 Get rid of your rubbish fast with the new 'Rubbish Removal' iPhone app from Dumpawaste, choose a collection time, and confirm your location – then press go. We’ll send you a quote to clear it right away.